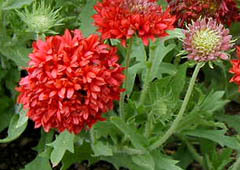 Gaillardia provides sizzling summer color to the garden with striking blooms in combinations of red, yellow and orange offset by deep brown centers. Great for hot, dry sites. Flowers are a colorful mix of yellow, red and orange with purple/maroon centers. Propagate by seed - Start seeds indoors 6 to 8 weeks before the last spring frost, or sow directly outdoors after the last frost. Do not cover the seeds, as they need light to germinate. Look for color variations, single, double and quilled flowers, and varying heights. �Double Mixed�: 3� wide single or bicolor flowers are double and come in shades of yellow, orange, red and cream. Plants grow to 2� tall. 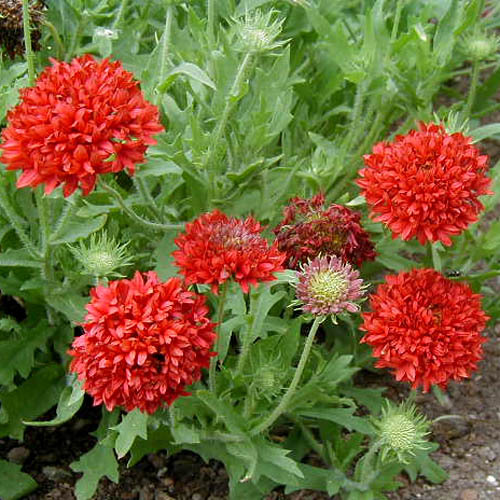 �Red Plume�: dwarf 1� tall plants are very drought and wind tolerant and bear vivid solid 2� wide red flowers. Very striking.